English Title: A Song for Kingdoms: From the Opera "Aida"
Based On: The opera "Aida"
In ancient Egypt of 3500 years ago, Pharaoh, King of Egypt, is about to appoint a general of the Egyptian army to again fight Ethiopia. Radames, a young Egyptian warrior, hopes he will be chosen as commander-in-chief, envisioning the chance of returning in triumph and of asking for the hand of Aida with whom he is secretly in love. Aida, Princess of Ethiopia, saved from death by Radames during the preceding war was taken to Egypt as a captive and, since then, lives as a slave. She too is attracted to the young and brave Radames, although she knows well that he is a warrior of the enemy of her country. However, being the slave she is, Aida never reveals to him her private thoughts. Radames promises Aida who grieves for her country that he will free the Ethiopian slaves once the war is over. She then asks him what the liberation of the Ethiopian slaves means to him. Amneris, Princess of Egypt, then glamorously enters with her court ladies from the top of a stone stairway. Amneris who loves the brave warrior Radames herself senses his feelings for Aida because of his way of turning his eyes upon Aida. Now that Radames is in love with Aida, Amneris is consumed by suspicion, and Aida is torn between her love for Radames and for her native land, their feelings surge and flow like the Nile. At last, priests announce the name of the general: Radames. He receives a sacred sword from Pharaoh and proudly looks out over the population whose shouts of victory fill the air. Egypt has defeated Ethiopia with Radames' surprise attack. 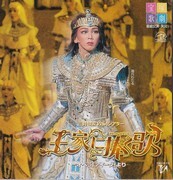 When Amneris hears the news of Radames' victory, she falsely informs Aida that Radames has died in action in order to discover Aida's true feelings. Aida cries with despair believing that she has lost her beloved and country. Amneris feels certain from Aida's reactions that Aida is her detestable rival in love. As Pharaoh's daughter, Amneris has gotten whatever she has wished for, with the only exception of Radames' love. Driven by jealousy, Amneris humiliates Aida by saying that Aida must be conceited enough to vie with the daughter of Pharaoh for Radames in defiance of her being a slave. Egyptian troops triumphantly file in to the capital Memphis. When Amneris decorates Radames with a royal collar for the victory, the population praises him in exultation. As Pharaoh questions him about his reward, Radames calls upon Pharaoh to grant the Ethiopians freedom. After the prisoners have been freed at Radames' solicitation, Egypt seems to have restored peace. However, a revengeful thought keeps burning in the minds of the royal clan of Ethiopia including Ubaldo, Aida's elder brother. Meanwhile, Egypt gets used to peace and loses prudence, becoming decadent. Amneris very much disappointed in such an Egypt asks Radames the meaning of peace. Although he tries to persuade her that peaceful state is only the beginning of a new history, Amneris is not at all convinced. At the end of the argument, lost in excitement, Amneris gives voice to the suspicion haunting her for some time. Whom does he really loves? Radames at last confesses that he loves Aida. Carried away by jealousy, Amneris threatens that she will do anything in order to gain his love and goes away. When Aida enters for a tryst with Radames, Amonasro appears before her. He preys on her feelings for Radames, forcing her to agree to ask Radames when Pharaoh is least guarded. Amonasro wants to take bloody vengeance on Pharaoh. Before leaving, he convinces her that she is the only person who can save her homeland. Aida is torn between love for Radames and love for her country. Radames enters and speaks out his love for her. Although she feels disconcerted by the abrupt circumstances, Aida at last tells him that she loves him in response to his passionate declaration of love. After they have confirmed their mutual love, they swim in bliss for a short while until they realize with horror that Amneris will never recognize their relationship. After a hesitation, he decides to abandon Egypt for Aida. He proposes that they flee Egypt on the 14th night counting from the new moon when Pharaoh dismisses his guards and prays the whole night for the prosperity of Egypt. Top star debut in the Grand Theater for Kozuki Wataru. This production was revived in 2015 to be the top star debut, also in the Grand Theater, for Asaka Manato. Cosmos Troupe ran the musical again at Hakata Theater in 2016. Final performance for Hiiro Moe and Kano Seiya. Created by jenebi. Last Modification: Friday 11 of August, 2017 13:04:40 PDT by lokai.